Predinner nibbles are a tradition in my family. A chance to catch up over chips, dips and cheese, washed down with wine and plenty of chatter. A warm, noisy, joyful affair. And no more so than at Christmas, where a generous spread is welcomed. Here are my top tips for a festive Christmas Cheese platter. Cheese, bread and crackers can be a dull looking affair, so use colour to liven up the plate. Red is my go to colour, it stimulates the appetite and contrasts well with cheeses’ muted tones of yellowy cream. Get green in there too and suddenly its starting to look a lot like Christmas. Think grapes, berries, red capsicum, cherries. Last year I made Sherry onions, this year pickled cherries and I got green in there with a Pistacio pesto, thanks to Tia Keenan’s The art of the cheese plate. Scroll down for the recipes. It’s summer in NZ, so at Christmas its time for bubbles, Sauvignon Blanc, Rose and crisp Pinot Gris. Reds are lighter, Pinot Noirs is great for the warmer weather. So find cheeses that will work well with the wine. 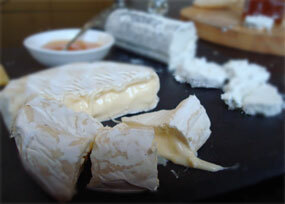 Think creamy, bloomy rinds which will rock a glass of bubbles., Savs are made for a crisp, young goats cheese. Creamier blues will stand up better to lighter summer drinks. Christmas is about bringing people together in a spirit of seasonal inclusion. So it’s not the time to bust out anything too strong or freaky. Unless you hang with folks who have adventurous cheese palates. Think a triple cream like Delice de Bourgogne or an accessible camembert, a nutty alpine or swiss style, Comte is always good.As for blue, Kikorangi, Roquefort or a Gorgonzola dolce are all easy eats. This is the time for generosity aka excess. So this year I went all out. I broke my rule about serving bread. Crackers don’t fill you up so much leaving room for the day of eating. Just make sure they are plain, no flavourings other than salt. Think nuts, fresh or dried fruit, relishes, vegetable crudites. Go overboard with variety of textures and shapes. This is a time of excess so put aside modern minimalism and cram in as much as you can. There’s nothing like overflowing bounty to show a generous festive spirit. Bust out the best china and silverware, Use the biggest platter you’ve got. I used a wooden tray with sides, and sat a chopping board inside. This meant I could fill the tray to over flowing, a joyful hodgepodge of Christmas cheer. Have fun and have a safe and happy Christmas! I don’t have a food processor so I chopped this by hand with a sharp knife, and made it old school. The recipe said to add everything except oil into food processor and pulse slowly adding oil. I liked the texture of my handmade version. Chop the pistachios, leaving some a little chunky. Finely chop or grind the fennel seeds. Make the pesto old-school. In a bowl put a handful of nuts, mix in lemon rind, salt. lemon juice and a slosh of oil. Stir well before repeating a number of times until all the ingredients are mixed in. Serve at room temperature. Covered this will last about a week in the fridge. Place cherries in a clean, glass jar. Place the rest of ingredients in a pot and bring to the boil. Simmer for 2-3 minutes. Pour pickle mixture over cherries. Bring to room temperature, cover and refrigerate till ready to use. This will keep for a couple of weeks in the fridge.